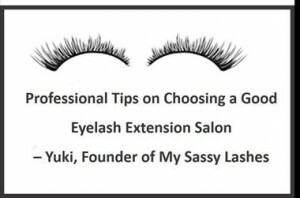 Ms Yuki, Founder, Trainer and Top Stylist of My Sassy Lashes, is a professionally trained and JANEA Certified Eyelash Specialist from Tokyo, Japan. With 7 years of experience in this industry, Yuki’s newly renovated salon only hires professional trained and certified eyelash specialists. My Sassy Lashes is one of the pioneer JANEA Certified Eyelash Extension Salon in Singapore and strictly uses safe and high quality lashes and lash glue imported from Japan. Thank you for sharing so much valuable information with us, Ms Yuki!